A group, Conference Of Harmonised Civil Society and Liberty Organizations in Nigeria, has given President Muhammadu Buhari a two-week ultimatum to sack Service Chiefs in the face of the deteriorating security problem in the country saying the continuous stay of the service chiefs was demoralizing. The group which decried the ceaseless killings going on in the country, said the development had reached a point that there was no more justification of the continued stay in office of the security chiefs. In its State of the Nation address at a press conference Friday, the Convener of the group, Iwen – Daniel Golozo, insisted that unless the security leaders were laid off their positions, the security of the country would not get any better, given their performances so far. “We wish to tell Nigerians that the tenure of the current service chiefs indeed expired several months ago and their purported (extension) by the president as announced by the minister of Defense in December 2017 is against the provisions of section 218 s.2 of the 1999 CONSTITUTION of the federal Republic of Nigeria. “The president by that section, is empowered to appoint only serving military officers whose service years are still active and in compliance with extant service rules, not to extend as purported. “The insecurity situation in the country as summarized above does not justify the continued enthusiasm of the president to further retain the service chiefs even at the expense of breaching the Constitution. “The continued retention in office of the said supposedly retired military personnel in top position as services chiefs has already killed the morale of many junior officers and this has greatly reflected in the current deteriorating security in the country. “The compulsory retirement of junior officers just to justify the continued stay in office of supposedly select retired military officers is unfair and demoralizing, “it added. According to him,” the coalition supports the legal inquiry Instituted by foremost civil rights movement leader and advocate Rev Solomon SEMAKA against the president and defense chiefs seeking the interpretation of the powers of the president under section 218 s.( 2) in the context which it used. Which case is Instituted at the Federal High Court Abuja before justice Ahmed Muhammad”. ” The coalition resolved to write a petition to the United nations organization for the attention of the security Council general assembly attaching all relevant documentary evidence. “That should the appointments of the service chiefs not be reviewed under two weeks, we shall be forced to show to the world the service records of all the service chiefs to prove the injustices melted to many junior officers at the detriment of Nigerians security . “The coalition suspects a conspiracy amongst a select individuals and the president to derail the course of justice and fair play and tamper with security apparatus of the state either for financial or political expediency all at the expense of the entire country. Are the current service chiefs indispensable? “The days ahead will unfold the true agenda for the illegal retention of supposedly retired military men as service chiefs. But Nigerians can’t be left in the dark any more. Let the president do the right thing for once, which of course is to persuade the service chiefs to resign and go on retirement which is the right thing to do both in law and practice, “he further said. The prepared text read by Golozo read further: “In Nigeria today, the security situation is rather embarrassingly absurd and terribly in a sordid state. This has dealt a big blow on our economy and certainly on our image as a nation especially amongst the other comity of nations. ” At the moment, while Boko Haram terrorist group appears to have been degraded in theory, reality has proved that it still stares us in the face in the North Eastern part of the Nigerian territory. ” Of course, the recent abduction of the Dapchi girls is a direct indictment of the federal government and the Nigerian military and particularly the Defense service chiefs. ” It is a confirmation that much more needs to be done other than paid advertorials claiming shadow victories of a war that is still beaming with steam and fanfare in the hearts of our citizens who for more than five years have left their homes for temporary shelter in various IDPs camps. ” It is sad that the government has failed to restore the minimum level of security that is needed for citizens to be assured of a normal dignified lifestyle. 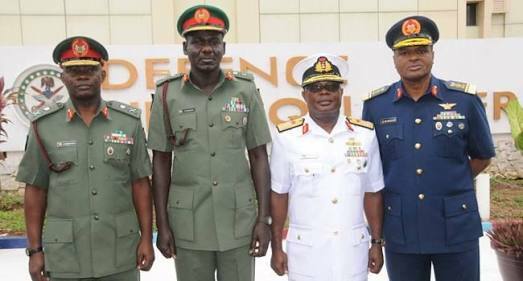 “Of course, this incompetence of the federal government military services is especially so glaring in that, till date the Chibok girls have been held hostage after four years of abduction by terrorist, this is especially sad given the assurances the appointment of the current service chiefs by President Buhari three years ago and the expectations that followed it. ” Today, Nigerians are nonetheless dissatisfied and disappointed and disenchanted for the grandest display of incompetence by the service security chiefs. ” While battling with the sad reality of the Boko Haram atrocities and its devastating effects on the economy, this nation and Nigerians were revisited with the the fourth most deadly and dangerous terrorist group otherwise known and pampered by the federal government military as “herdsmen” rather than the terrorists that they are. “It would please Nigerians to know that the federal government as currently led by President Buhari has on many occasions stood in as advocates in defense of the “herdsmen” advancing various romantic policies in favour of the dreaded terrorist group now the most dangerous in the country and fourth most dangerous in the world. “The recent statement of the president while on a state visit to the United States of America that herdsmen do not carry AK 47 and other deadly weapons is an Indictment on our security system which implies that it’s unable to detect the external forces killing Nigerians in droves daily. “Who hasn’t heard of the presidents open blame of fleeing forces from Libya? And to think they come into the country to threaten our territorial space without a response from our military is quite frankly damning.